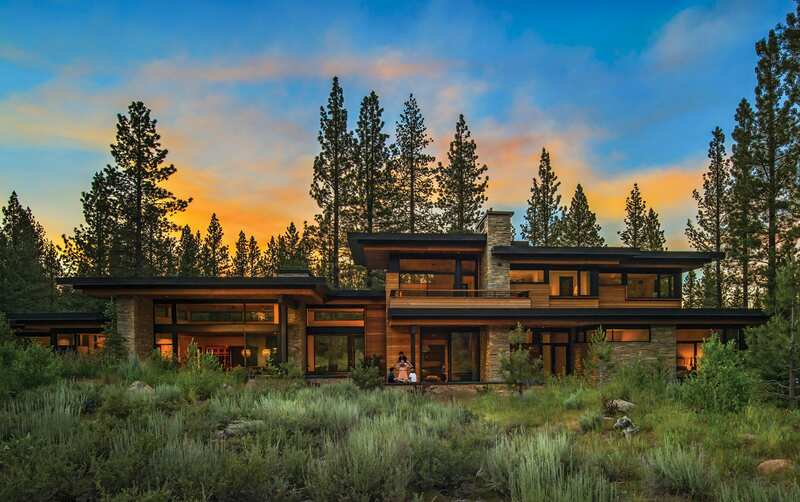 During the initial phase of this Martis Camp project, the owners wanted nothing more than a durable second home that catered to their family’s active lifestyle. But as the project evolved, so, too, did their tastes and desires. 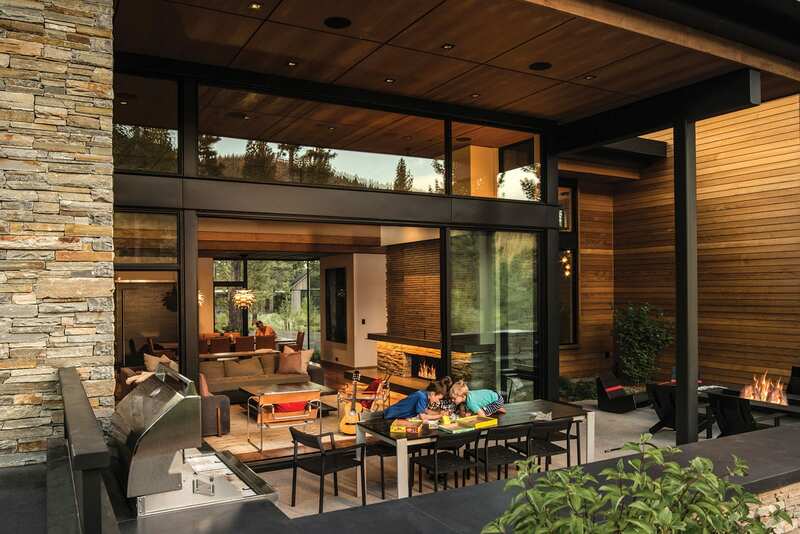 Designer David Horan of Truckee’s Ryan Group Architects (RGA) has that effect on his clients. “At Ryan Group, we believe what makes us unique is our approach and level of service and design. We internally test and critique many options to offer our clients several design solutions to consider. It’s a thorough process creating and encouraging collaboration,” says Horan, adding that one of his goals as an architect is to defy style. Modern aspects include level roofs with strong horizontal lines that appear to float above the walls via ribbon windows, ample amounts of glass dividing interior and exterior spaces, exposed metals, rigorous interior design detail, and fully integrated home control systems. 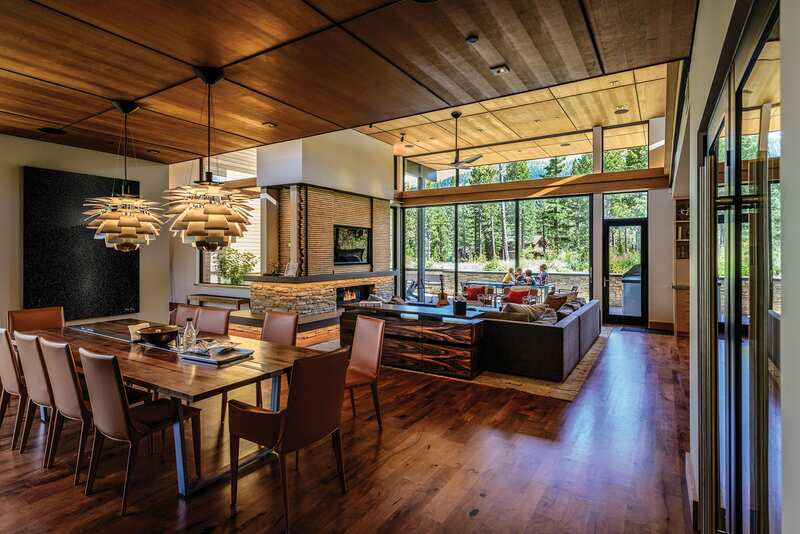 The modern design is comforted with rustic elements such as richly hued mesquite and cork flooring, engineered lumber detailing, vertical-grain Douglas fir plywood ceilings, and warm lighting and cabinetry detailing and finish selections. 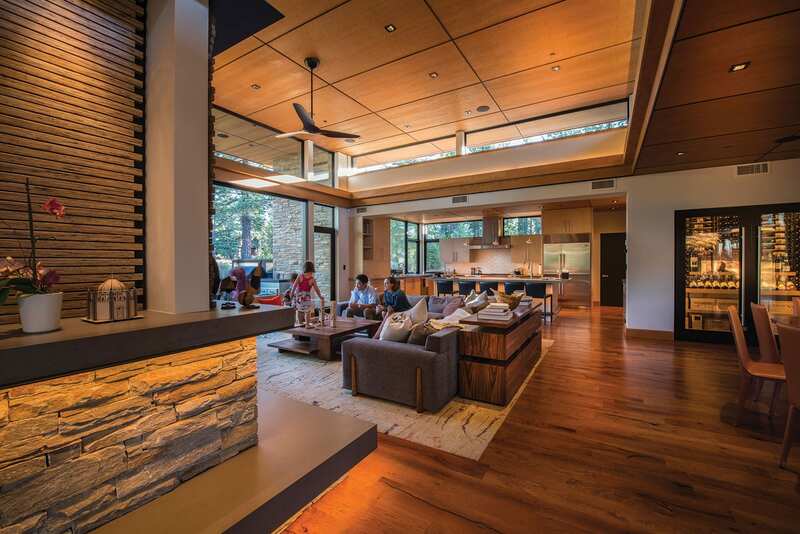 Furnishings vary between mountain and modern, and reflect the talents of RGA interior designer Annie MacFadyen. Completed in December 2015, the home was designed to capture one’s attention immediately upon arrival. It starts with the garage doors, which were constructed of glass and metal with horizontal strips of wood that emit a “warm, glowing lantern” feel when the lights are on, Horan says. A door from the garage opens to a mudroom with individual lockers for each family member and their guests, as well as chalkboards the owners’ young children use to draw on and exchange notes. Walking into the great room, which features expansive ceilings, guests are greeted by what Horan calls “pupil pop.” The term, coined by RGA associate architect Brendan Riley, describes a home’s entry presence-in this case, a large fire pit and water feature on the terrace beyond, with a stellar view of Northstar’s Lookout Mountain, plus a fully landscaped property including earth mounding that provides a sense of outdoor place and privacy. An in-ground trampoline is tucked discretely around the corner. Herrington—whom the owners nicknamed “not a problem Tad” because of his willingness to accommodate their spontaneous requests—notes that the home has a nice separation between the community areas and bedroom wings. A long, wide hallway on the main floor leads to four isolated bedrooms for kids and guests, while the entire upstairs is dedicated to the master suite. The owner also enjoys the many high-tech features of the home: window blinds that quietly disappear with the push of a button, a hidden TV, and the ability to remotely fire up the heater, turn on music, spy the video cameras or set the security system, all from her phone. 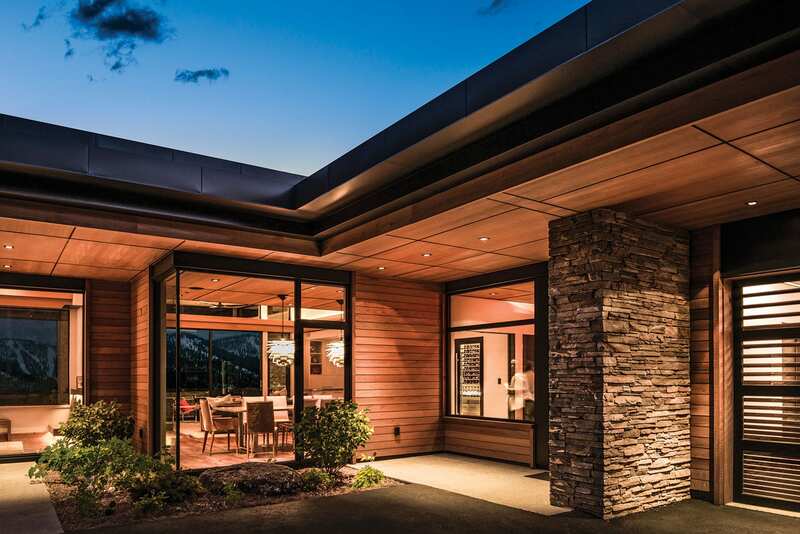 “Sometimes smart houses aren’t as smart you think, but the guys who did this for us were able to integrate all the electrical, audio, visual—everything—seamlessly,” says Herrington, crediting Truckee’s Hood Branco Innovations, Inc., for the work. Other key players who left their mark on the project include Blide Landscape, RGA’s Jennifer Trombetta and Ben Garberson, Crestwood Construction’s Marshall Williams, Eckard Roofing, Johansen Masonry, Powersurge Electric and Pro H20 Heating & Plumbing, among others.